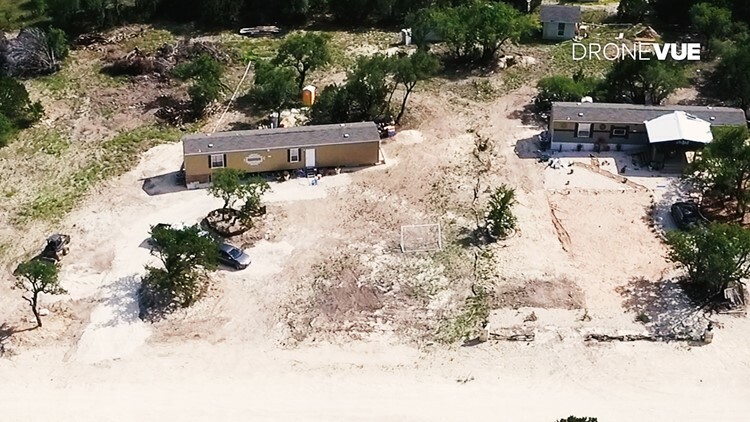 Families living in a new development in northwest Travis County live with no water or sewer lines connected to their homes. 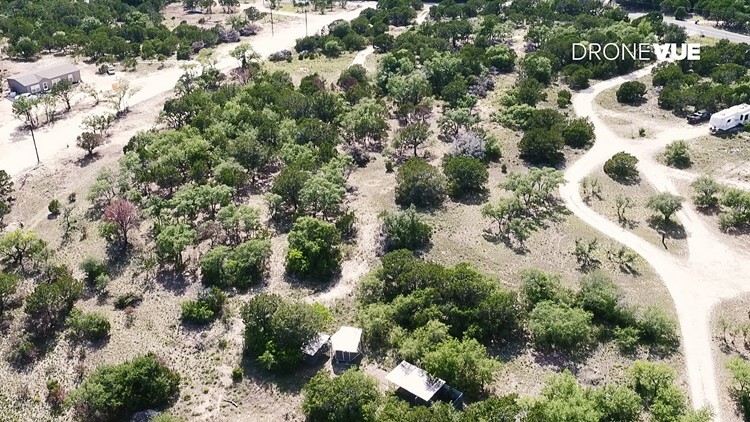 Residents said they were promised a space to build in the beautiful Texas Hill Country, but added they didn’t fully realize what they were sold. The developer, Chaparral Woods, LLC, failed to provide basic infrastructure. “They came through here and pushed over trees,” said Rob Faccone, as KVUE’s DroneVUE gathered aerial images. Neighbors Rob Faccone and Chad Moss called the KVUE defenders when their own properties were impacted. Faccone said a developer cut through his land and set fire along the perimeter. He said he called the nearby fire department when the fire jumped to his property. “All of this was set around my chicken coups,” said Faccone. From hovering above Faccone’s land, DroneVUE captured video of portable toilets sitting outside manufactured homes. Large water tanks sat on some of the properties. Families there told KVUE they don’t have water lines, but hope to have it soon. “It’s just terrible,” said Moss who lives across the street from the development. “It was some time last year that we started noticing signs going up and lots for sale. It wasn’t our say to do with their property. We assumed they were going through the proper channels,” said Moss. Being neighborly doesn’t mean looking the other way. Moss called the county when work crews damaged his property. The declaration shows Chaparral Woods is made up of two 10-acre sections. Each section will hold “units” each. What’s listed as a “condo” is the land only. Records on file with the Travis County Clerk and the Travis Central Appraisal District show 14 lots sold already. Deeds show the buyers each paid $10 down. All but one person financed through a Wraparound Note with Chaparral Woods, LLC. The divided land was sold ranging from $45,000 to $117,000 per lot. The Deeds of Trust show the developer took a loan for $330,000 to buy the 20 acres. So, Chaparral Woods, LLC, could make as much as $612,110 if they provided no infrastructure and sold no additional lots. “Never in a million years would we buy up this property, strip it up and sell it off to other people,” said Moss, referring to his own land. “The real estate developers made some misrepresentations that induced them into buying the land,” said Daniel Smith, Associate Attorney with The Law Office of Joel A. Levine, PLLC. Smith is retained by some of the buyers. The Travis County Transportation and Natural Resources office, who regulates land permitting and development, referred the KVUE Defenders to the county’s public information office. They refused to answer our questions on camera, but provided a statement. “Travis County Transportation and Natural Resources has been made aware of the Chaparral Drive subdivision. 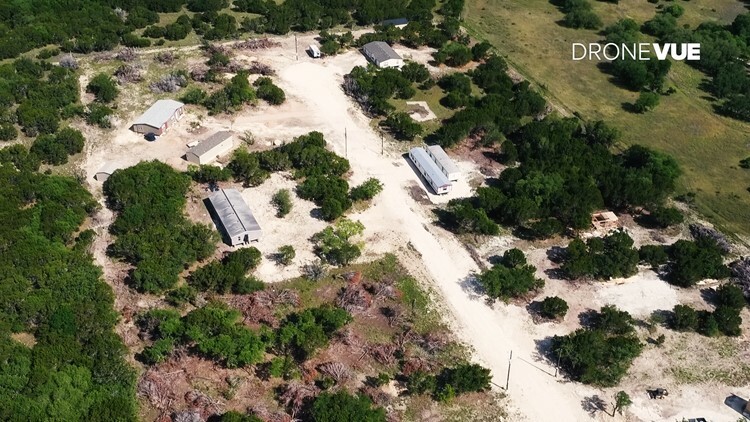 They have investigated the subdivision and sent their case to the Travis County Attorney’s Office,” said Hector Nieto, Public Information Officer for Travis County Commissioners Court. “Are they really only using the porta potties?” asked former Travis County Judge Bill Aleshire. KVUE asked Aleshire to weigh in. He’s an attorney who focuses on government issues. “This looks like a colonia,” said Aleshire. Colonias are substandard housing developments which lack basic services. They’re illegal in Texas. 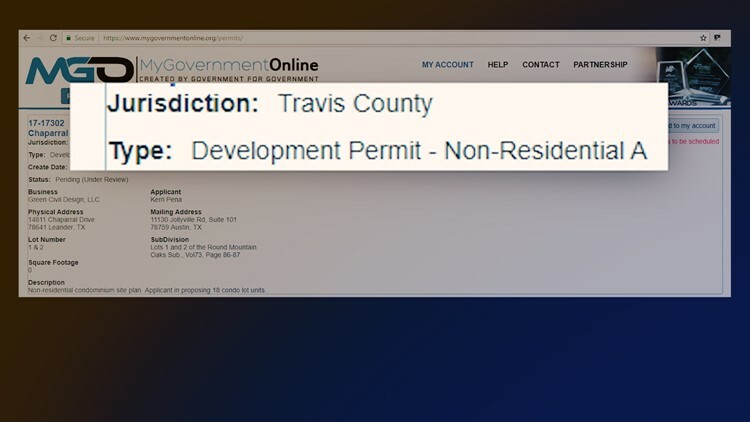 Screenshot of a development permit submitted to Travis County. The applicant, Kerri Pena with Green Civil Design, LLC, said they only prepared a site plan and referred KVUE to the property owner for answers. KVUE tried to contact Chaparral Woods, LLC managers Alan Shield Jr. and Stacy Howard. Their names are signed on the declaration. Five days of phone calls and emails were not returned. “It appears that they think that by declaring a condominium as opposed to going to the normal subdivision plat that they might think they can get by without the subdivision rules and regulations, but I think they’re wrong about that,” said Aleshire. "We are working with our homeowners and the proper Travis County departments to correct the permitting issue. We have had several problems with the project and we are doing everything in our power to fix it. We will stay in the deal to get it finished, finaled and satisfy Travis County for our homesites. We want to be clear that we have not made any money on the project and we will continue to correct and complete the project to Travis County Specs. Our ultimate goal is to provide affordable and safe homesites for families in Travis County." The responsibility now falls on Travis County. “If nothing is ever done, and that infrastructure is not put in place, what we’ve seen from history is that the rest of the taxpayers end up being asked to come back in and fix it like it should have been done,” said Aleshire. The Texas Attorney General’s office confirmed it’s aware of the development but also would not comment. You can protect yourself from buying into something like this by asking for a “subdivision plat” approved by a county or city commission. To read the Travis County Development Regulations, click here. If you suspect an illegal subdivision is being built, file a complaint with the Texas Attorney General’s Office. Click here. Follow Erica Proffer on Twitter @ericaproffer, Facebook @ericaprofferjournalist, and Instagram @ericaproffer. Follow Joe Ellis on Twitter @JoeEllisATX.